Yesterday (Saturday) I met a bunch of my friends again at church...a different type of church, mind you, but there's always such good fellowship there. I even met a teller from my bank. It was great to see Kathy at church. Made me wonder what she was "depositing" there. The Church of the Seventh Day Dumpists hold services between 9:00 and 5:00 on Saturdays. They have meetings other days too but the weekend meetings are always well attended. Yesterday's get-togethers were no exception. There was a excellent turnout. No place to park. My kids always look forward to going with me. It's such a relief to have children who can't wait to go to church. Invariably they get something good out of it and bring it home with them. Why yesterday I even brought home a new Bible for my collection...The New English Bible. I often see more of my neighbors at our Saturday church than I do on our road. We meet there and always say, "We should get together for coffee." But, we never do. The Seventh Day Dumpists have been around for quite awhile. Perhaps you've never heard of this denomination. Perhaps the Dunkers or the Doukobors but not the Dumpists. The patron saint of the Dumpists, Father Seymour Trash, once said, "I count all things as refuse..."
This church has become a little unorthodox though. Rather than talking about redemption we refer to it as recycling. There are big bins where we can get rid of stuff and a big ol' shed where we can pick up old golf clubs, New English Bibles and old 10" televisions from 1956. Hopefully by now you've guessed that I'm speaking about out weekly trips to the dump or, as the more cultured people call it, the transfer centre. I always meet friends there. That's why I asked Carol not to buy the genuine maple syrup that comes in glass bottles that look like Crown Royale whiskey decanters. I just hate to see my neighbors, with poor eyesight, judging me for drinking too much. The fellowship there is always great! The kids love attending! There's always something for everyone! You can get rid of your "junk" and start over again! Great reasons for being a Seventh Day Dumpist...I think. 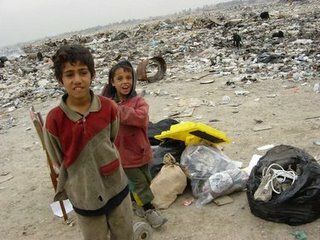 On a more serious note, many families in Third World countries actually live at or on the garbage dump. This is the only food, shelter and clothing they can find. Missionaries in many countries carry on their ministry of mercy at these disease-infested places, reaching out to the people who live there with God's love and compassion. God forbid that we should carry on living so comfortably with all our "stuff" while others beg for a crumb of bread on the garbage heaps of poverty stricken countries. Seventh Day Dumpist? Haven't heard that before.. I used to have friends who lived around there and I heard it being call the Caven K-Mart. I used to laugh LOUDLY! Anyway.. thanks for posting today!